I don't much like this homily. . .I wrote it this afternoon. . .blech. As the day progresses, my attention and creativity wane significantly. Homilies written in the afternoons will inevitably be more scattered and less creative. However, my experience has always been: someone will find something they needed to hear. I know I did! Church of the Incarnation, U.D. Have you heard that moral evil is really just an illusion? Or that there really is no real difference between the sacred and the profane? Or that faith is primarily a matter of good feelings? Have you ever been taught that the Body and Blood of Christ in the Eucharist is a symbol? Or that the celebration of the Eucharist itself is all about building community? Or that sin is not something you need to worry much about? Perhaps you have been lead to believe that God loves you more when you do good works? Or that the Blessed Mother guarantees the good results of a novena? Or that burying a statue of St Joseph in your yard will get your house sold? If we took a survey here this afternoon, how many of you would know that Jesus Christ is one person with two natures; or that the Trinity is One God in Three Persons; or whose sinless origins the dogma of the Immaculate Conception describes? Could you accurately define the gift of infallibility and distinguish it from impeccability? Do you know the difference between dogma and doctrine, tradition and custom? If you don't, you might want to say that these are obscure questions that only academic theologians should be worried about. All I need to do is love God and be a good person. OK. What does it mean to love God? What is a good person? For that matter, what is a person, human or divine? What does it mean to be good, to do good works? Why should anyone love God and be a good person? Now you know what my students feel like during class? The point of this border-line insulting harangue is not to make you feel ignorant, but rather to point out the vocation of a good Christian teacher: teachers of the faith lead those who do not know the truth of Christ—yet desire to know him—into knowing his truth and from this acquired knowledge of Christ's truth, lead the newly enlightened into the righteousness he promised us. When we know God, we love God. In fact, knowing God and loving God are two sides of the same act. But to know this truth, you need a faithful teacher. Unfortunately, not all teachers of the faith teach faithfully. We have been warned. St Augustine had this to say about teachers who stray from the lessons of the one True Teacher: “[Teachers] sin. . .not when they say a good deal in agreement with [Christ] but when they add their own notions. This is how they fall from much speaking into false speaking.”* The prophet, Jeremiah, preaches against wicked teachers, unjust shepherds: “Woe to the shepherds who mislead and scatter the flock of my pasture, says the Lord. . .You have scattered my sheep and driven them away. You have not cared for them, but I will take care to punish your evil deeds.” How often do you hear teaching connected to caring? Good teachers teach the truth of Christ because they care for God's people. Instructing the ignorant by “false speaking” not only leaves the ignorant in their ignorance, but it scatters them from the safety of the truth, driving them away to be dinner for wolves. Scattering sheep is easy. Just yell and flail your arms a bit. There is no high art to it. Nor is there any high art or complex theory to not-caring. It springs immediately from the heart of a teacher determined to impart the imperfection of human prejudice over and above the incarnated perfection we find in Christ. We are thankful that our Lord did not succumb to this temptation: “When [Jesus] disembarked [from the boat] and saw the vast crowd, his heart was moved with pity for them, for they were like sheep without a shepherd; and he began to teach them many things.” Paul reminds the Ephesians of one of these many things that Jesus taught: “[Christ] came and preached peace to you who were far off and peace to those who were near, for through him we both have access in one Spirit to the Father.” Paul notes that the peace Christ brings is not the peace of a gun-free, crime-free culture, but rather the calm that settles over our souls when we realize “that through his flesh, [Christ] abolish[ed] the law with its commandments and legal claims,” and we are no longer driven to crippling anxiety over whether or not our animal sacrifice was pure enough to gain us access to God and the forgiveness of our sins. Because they cared for God's people, Jesus and Paul taught the truth of the new covenant, and we hear that truth spoken again this afternoon because they still care; they still long for us to come to God, holy and righteous. Do we listen and act accordingly? Or do we allow ourselves to be scattered and driven off like sheep ready for the wolves' stew? In his gospel account, Matthew focuses on Jesus and the disciples, showing them all to be nearly tireless healers and preachers. But look at the crowd, the people who follow them and gather before them. Needing a well-deserved retreat, Jesus and his friends try to boat across the lake for a quick nap and a snack. They almost make it, but the crowd converges from all over the countryside and gather again to hear the gospel and to receive healing. These are not people who want to be lied to, or shown magic tricks, or told to go away. They want the truth. They have taken it upon themselves to follow behind the Lord and seek out his teaching. And because they had no one to teach them the truth of God's loving-care, Jesus had compassion on them and did what every excellent Christian teacher will do for the next 2,000 years. He taught them. He taught them many things. All of them true. How fervently, how tirelessly do we seek out the truth of many things? How long and hard will we follow Christ to be taught the truth of God's loving-care? How much of our time and energy and material resources are we willing to sacrifice to know even one true thing? We can look to our teachers and hope that they will give us the truth we were made to know and live. We can call on our bishops, priests, and theologians to faithfully preach and teach God's Word. We can even complain bitterly when they fail to do so. I have it on good authority that the Vatican receives more letters of complaint from Catholics in the U.S. than any other nation in the world. We are heard. But are we taking responsibility for seeking out and living the truth that we all have immediate access to? Are we following Christ and his disciples across the lakes and rivers and crowding around until compassion drives them to teach us? Or are we accepting as good enough the first lesson we hear that scratches our favorite itch? Giving our hearts to the loudest professor of theology, or the most generous politician, or the hippest bishop? Jesus taught the crowd because they clamored to be taught. The great medieval teacher of the faith, Thomas Aquinas, argues that knowledge is received by the hungry mind according to its hunger. In other words, how and what we eat depends on what we are hungry for. If you long for a fervent, fiery lesson in the truth of Christ, then pursue his truth with fervor and fire. If you long for the steely cold facts of the faith, then straighten your backbone with cold steel and ask for it! If, however, you want sugary junk food and poisonous sodas, then hang around on the corner for a while, a teacher who speaks falsely will be along soon enough. And he will be more than delighted to feed you your fill. Just don't come complaining to the Church because you suffer from spiritual diarrhea. The Psalmist sings, “The Lord is my shepherd and there is nothing that I want.” When you are stuffed to the limit with the truth our Lord has to teach, nothing else will ever satisfy. Worried that the bothersome teacher from Nazareth is gaining public support for his blasphemies, the Pharisees go out against Jesus. In response, Jesus retreats away from them. Despite official opposition, the people follow behind him. It is not likely that many of us here this morning are professionally-trained military tacticians. However, even the amateur strategist can appreciate the beauty and good sense of Jesus' of tactical move here. Faced with strong opposition, Jesus withdraws, taking the crowds with him. Why is this a smart move? First, it would be difficult for the Pharisees to challenge Jesus if he is not around to be challenged. Second, there can be no public denunciation of his heresies if there is no public to whom he might be denounced. Third, Jesus knows he has the better of his opponents. After all, he is Just Servant prophesied by Isaiah. Truly, there is no good reason for him to stick around and risk capture—not yet, at least. But are we even a little bit troubled by what some might interpret as cowardice on Jesus' part? Why not stay put, preach boldly, perform miracles, and trounce the Pharisees soundly for all to see? Wouldn't this be an awesome way to spread the Good News? Imagine the headlines: NAZAREAN PROPHET GIVES PHARISEES PUBLIC SPANKING; MULTITUDES HEALED, ISSUES CRYPTIC WARNING. And it is that cryptic warning that should lead us to understand Jesus' strategy—even if we do not approve of it. Bizarre as it might seem, our Lord is actually increasing the possibility that his Good News will be spread far and wide when he forbids those healed from making him known. We know that he has issued this odd-ball order before: “You are healed. But tell no one.” Aren't we supposed to be witnesses, giving testimony in the market place, in the temple, and at work? Shouldn't we be on the rooftops shouting ourselves hoarse? Yes, sometimes this is exactly what we should be doing. Evidently, not every moment of our day is to be a verbal witness to the Lord's mercy. Sometimes, we just have to withdraw with Jesus, knowing he has a good reason, the better argument, and the best for us in mind. If it is true—as the Psalmist says—that the Lord's mercy endures forever, then it follows that we are gifted with his compassion from the very beginning and will be so gifted until and beyond the end. In fact, because we live and breath in his loving-kindness, we will have no end; or rather, his mercy is our end, our goal and purpose. Accepting this faithful fact should lead us to another joyous truth: the salvation of the world through the preaching of the Gospel is not our job alone. We have our battles to fight. Our own Pharisees to confront. Our arguments to present and objections to make. We even have our own jobs to do in the years we are given. But the Whole Project of cosmic redemption is not our task. Our task is to do the Lord's will here and now, using what we have at hand and leaving what has to left undone undone. Sometimes the best evangelical strategy is retreat. And retreat is no act of cowardice when the crowds follow us away from falsehood and disease. That the multitudes would follow us at all is the best testimony we could offer to those who look upon us with skeptical eyes and unbelieving ears. See! Even in our retreating silence, the sick, injured, and demon possessed follow the healing Word! From the ancient history of Israel, the prophet Isaiah saw the coming of the Just Servant and proclaimed his saving ministry among God's people. From way back then, he saw and waited. So did the people of Israel. They waited on Christ. Though he has come, gone, and will come again, we witness to his healing touch when we testify in word and deed, and when we withdraw into a waiting silence. Cowardice is the failure to do the right thing in a face of adversity. Courage is the gift of doing the righteous thing even when it may appear to be dead-wrong. When you retreat with a heart made bold in mercy, look behind you. . .you just might have more company than you think. The promoters of Justice & Peace for the Order have asked members of the "Dominican Family" to write to The Powers That Be and protest/demand/agitate that something or another Be Done about the military coup that ousted Chavez crony, Zelaya from the Presidency of Honduras. I've followed the story headlines and watched a few soundbites on FOX and CNN, but the details of the whole mess flew by in a blur. Honestly, I didn't really pay much attention until the predictably left-sympathetic J & P crowd of the Order asked me to pay attention. And when I did, I found this: Honduras' Non-coup. It is unclear to me how a country's democratically elected Congress, civilian-controlled military, and Supreme Court can illegally remove that country's President. . . Imagine for a moment that in July of 2008, George W. Bush had ordered the U.S. Marines to conduct a referendum on changing the 22st amendment of the Constitution so that he could run for a third term. Imagine too that Bush's own Attorney General at the time, Michael Mukasey, declared his boss' move illegal and went to the U.S. Supreme Court for relief. The Court, in a unanimous vote, declared the referendum unconstitutional and ordered it stopped. Imagine that Bush then ignores the order and proceeds with the illegal referendum. Imagine that Congress then impeaches Bush for treason with only six extreme right-wing members voting against the impeachment. Bush again ignores both the Congress and the Supreme Court, refuses to relinquish power, and continues with the referendum. Imagine that the Supreme Court, again unanimously, orders the Marines to arrest Bush and declares another Republican to be the President until the American people choose a new President in the November elections. Imagine that only about 28% of Americans support Bush's move to amend the Constitution illegally, but 100% of the region's right-wing military dictatorships think a third Bush term is a fantastic idea and promise to intervene in the process with military and financial assistance. Imagine that Cardinal Francis George meets with Congress and the U.S. Supreme Court and publicly acknowledges that the impeachment and arrest orders are legit. Could you imagine--with these facts--that the liberal-left media and progressive religious leaders would be calling Bush's impeachment "a coup"? That they would be lauding Bush as a victim and calling for his immediate return to the Oval Office? If you can, then your imagination is far, far livelier than mine. Of course, there are lots of folks out there challenging the veracity of the details in Estrada's article. One writer described the narrative put forward by Estrada as the party-line of the Honduran "Oligarchic Diaspora." Nice phrase, but the possibility that Estrada is an oligarch in exile doesn't change the facts. Even land-owning meanies can believe the truth once in a while. So, what's my point? The credibility of the justice and peace efforts of the Dominican Order are seriously damaged when those charged with directing our efforts in this area jump on every fashionable left-liberal cause and uncritically accept as unimpeachable evidence any narrative that tells a terrible tale about those that they imagine are oppressing the poor. Not every general, not every landowner or banker or conservative politician is out there stomping on human rights. Sometimes the left is the oppressor, the usurper of democracy. Just once I would love to read an appeal from the OP's J & P office that asks friars to write Congress and demand that the human rights of the nearly two million citizens murdered every year by their own mothers be defended. Given the consistency with which our brothers and sisters in that office line up behind left-liberal causes, I'm not holding my breath. Drink the Kool-Aid/Hope & Change Have Just Begun! Pope Benedict XVI has injured his second most valuable physical asset! The Holy Father broke his right wrist in a fall while on vacation. I told him not to go hot-doggin' it down those Alpine slopes! Does he listen? Nooooooo. . .
Pray for his quick recovery. 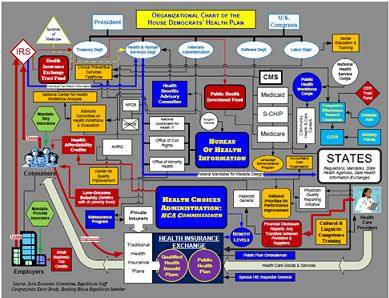 The GOP flowchart demonstrating the morass of convoluted bureaucracy that Obamacare will impose on the American people looks like a map of how my brain works after 2.00pm everyday. I think the Republicans must have secretly implanted a chip in my head to monitor my neurons. Now where did I put that tin-foil. . .? Perhaps THE best journal of religion and the public life, First Things, is conducting a survey of religious beliefs and practices on college campuses. No doubt this information will be helpful to campus ministers. If you are a student (or a recent graduate), please take a moment to answer their survey. Ah ha! Jesus is admonishing the Pharisees for following the rules; he’s berating them for being concerned about the Law, about procedure and process; therefore, we, as followers of the Way of Christ, are under no obligation to follow the Law or any law, and all of those puritanical restrictions against our favorite, former sins are now abrogated! We are free indeed! God desires mercy from us, not our empty, choreographed sacrifices inside an over decorated, incense-choked building! Thanks be to God we are free. . .! As I said, in a breath and two heartbeats utter nonsense starts to sound like wholesome logic. This is our temptation here: to take what is a profoundly subtle ethical teaching from Christ, ignore the subtleties in favor of what we want to hear, and make Christ’s teaching into an excuse for sin. The Devil’s means for the Devil’s ends indeed. Where do we go wrong with this teaching? We go wrong with this teaching when we place mercy and sacrifice against one another, in conflict with one another, and we come out believing that we are to do one and not the other. The truth that Jesus is trying to push into the legalistic brains of the Pharisees is that showing mercy to a sinner is a sacrifice; to be merciful is sacrificial. The logic of mercy requires you to forgive an offense against you w/o asking for what you are justly owed in compensation for the offense. You “sacrifice” what is rightfully yours in exchange for nothing, for nothing at all. In effect, there never was any offense. We can say that this or that bad act was committed—Jesus doesn’t deny that his disciples are picking grain on the Sabbath—but once sacrificial mercy is shown to the actors, we cannot say that any offense was given by the act. Jesus calls David and the priests and his disciples “innocent men.” No offense, no sin. Divine mercy then is that kind of love that sees clearly into the heart of the sinner and rightly discerns what drives him to offend. However, only God has such clarity, the clarity to know perfectly a heart’s intent; you and I are called to a far more difficult task: to show mercy as a sacrificial habit; as a virtue faithfully, daily practiced without the benefit of a divine mind to see inside another person’s motive! So, does God want mercy from us rather than sacrifice? Yes, if by “sacrifice” we mean “merely following the Law jot and tittle.” Does God want mercy from us rather than sacrifice? No, if by “sacrifice” we mean “offering to God what we are owed in order to make it holy.” God wants us to be merciful as a sacrifice. Why is this difficult for us? My guess: being offended makes us the creditor, we are owed. And being owed a debt gives us power. This is the Devil’s means to another one of his favorite ends: you in Hell with all the foolish. Poke him in the eye by giving up what is owed you—sacrifice in mercy and live among the wise. I'm feeling a little light-headed. . .
My thesis director wants the first chapters of the thesis by July 30th. . .and the next two by August 20th. . .
. . .(faints). . .
A former student of mine, Sean DeWitt (seminarian for the Diocese of Austin) is writing a series of posts on Caritas in veritate. The easy yoke of "Ipsum Esse Subsistens"
God reveals Himself to Moses on Mr Horeb as “ipsum esse subsistens.” What God Is and That God Is are identical. God exists essentially. He is existentially essential. As Being Himself there is no difference between God's essence and His existence. No difference, no distinction. Using the first person imperfect of the Hebrew verb “to be,” God unveils the mystery of His abiding presence to Moses as Having Been-Is now-Will Always Be: I AM Who Is. At this revelation we are stunned into reverent silence. It is unlikely that any limited creature will truly grasp the full measure of this unveiled mystery. So, we must ask: who among us, when pressed with disaster, cries out: “Being Itself! Help me!”? Who among us, when possessed by joy, sings: “Ipsum Esse Subsistens, I give you thanks!”? None of us gets out of bed on Sunday morning to offer praise and thanksgiving to Essential Existence. No Christian soul searches for love in I AM. Our faith and hope excel in a God Who has always, is now, and will always be our Father, our brother, and our very life here on earth and in heaven to come. Along with preaching his Good News, Jesus spends a great deal of time warning anyone who will listen that the Way back to the Father is an adventure worthy of heroes. There will be great deeds performed by those of us who follow him: moments of triumph over evil; terrible injustices rectified; diseases and infirmities cured; demonic spirits expelled. We will also suffer harrowing tests: religious and political persecution; exile and torture; and even death for the sake of his name. To join this epic of salvation all we must do is abandon family and friends; shrug off wealth and prestige; go out into the desert of selfless service; and follow behind him, bearing our crosses to a sacrificial end. He promises us suffering, and our deaths are guaranteed. How strange is it then that we hear Jesus say this morning, “...my yoke is easy, and my burden light”? What's so easy and light about torture and death?! Wealth and security sound much easier and a whole lot lighter! For that matter, I am not particularly soothed by the prospect of being water-boarded defending the honor of Essential Existence. Fair enough, pain and suffering do not seem to be much of an incentive to risk life and limb in the defense of Esse Subsistens. But do wealth, prestige, and the boredom of security offer us the adventure of preaching the Good News of God's mercy, of bringing the lost back into the family, of living lives steeped in the luxury of knowing that we serve a God of loving-care? Can anyone we attach ourselves to in this world offer us a life beyond temporary affection? Can anything we own guarantee happiness beyond its limited warranty? Even the praise of our fellow citizens fades and the awards we win get dusty and dry. Nothing created—no existing thing—can ever bring us to the excellence that God has created us to be. With Him—Perfect Being—we are made fully human, impeccably whole. Will you suffer and die for the sake of sharing in this promised glory? God unveils the mystery of His Being to Moses. To Moses God is revealed as I AM WHO IS and WHO WILL ALWAYS BE. But He says to Moses as well, “I have watched over you with care; I am concerned about you and My people. Go tell them that I have sent you to deliver them from the misery of slavery for My sake.” To Moses Ipsum Esse Subsistens promises deliverance and He does exactly that. To us, He not only promises deliverance from slavery, He promises an eternal life with Him in Christ. The Father promises; the Son delivers; and the Love they share comes with us on the Way, lifting the burden of our labors by showing us how to love one another as God Himself loves. Even the sweatiest work is made easy when it is done for love. Moses the shepherd sees a bush burning in the desert. Strange enough. Even stranger still: though the bush is burning, it is not reduced to ash. Both surprised and curious, Moses wants to know why the bush is not consumed by the flame. As he approaches this “remarkable sight,” a voice calls out, “Moses, Moses.” Hearing his name spoken in fire, Moses stops, screams like a scalded camel, and runs home in terror! When he recalls his encounter with the flaming shrub, no one in his family believes him. After years of therapy, Moses concludes that the whole incident resulted from dehydration, low blood-sugar, and a deeply embedded sub-conscious fear of vegetation. He resumes his work as a shepherd and avoids contact with anything that might be called bramble, hedge, or scrub. He dies a very old man secure in his well-managed anxiety around wilderness foliage. How do you react to God's voice flaming out at you? Do you scream and run in terror? Or do you follow the real Moses' example and answer, “Here I am”? Moses, the terrified shepherd, chose to flee God's revelation and rationalize his encounter with the fiery voice of the shrub as a product of physical depletion and psychological trauma. Perhaps we can forgive this fantasy version of Moses b/c we might be tempted to follow his fainthearted example! Fortunately, the real Moses, upon hearing his name called from the fire, approached the bush and said instead, “Here I am.” Moses surrenders his courageous heart to this world's most dangerous message: the God of Abraham, Isaac, and Jacob lives and He has a job that needs to be done. Because he bravely stepped forward and answered to his name, Moses is sent to free God's people from slavery in Egypt. And like any of us given a similar task, Moses says, “What?! Me!? Who I am to do this work? !” Who indeed? As the Church, the Body of Christ on earth, we are each called by name and sent out to do the work of freeing God's people from slavery. This might be the literal slavery of child-trafficking or forced prostitution. This might be the slavery of poverty or political and religious oppression. This might be the slavery of individual disobedience and personal vice. Whatever face slavery wears, the chains that bind are held fast by sin and the fear of death. Liberation for slaves begins when they are told that the Pharaoh of Sin is powerless, his armies defeated, and the God of Abraham, Isaac, and Jacob has commanded him to “let My people go.” Liberation for the slaves arrives when they receive this revelation and begin to live lives freed from Pharaoh's rule. Where the dignity of the human person is violated by sin, the message of freedom in Christ must be announced. And when this revelation is received, it must be lived. Not only by the one who hears it but by the one who speaks it as well. Who am I to do this work? Who are you? If we say to the burning bush—wherever it may appear—“Here I am,” we become ones sent to announce freedom from sin in Christ. First called, we call. First freed, we free. We become exactly who God calls us to be: Christ dying on his cross for the salvation of the world. *Milestones: Memoirs 1927-1977, pg 108. Here's some excellent news. . .
"With great heaviness of heart, we write to inform you that VOTF is at the crossroads of financial survival. . .Unfortunately, our financial condition has deteriorated before the rollout the Strategic Plan. As of early July, VOTF's reserves have all but been depleted, and it faces the prospects of not being able to pay for recurring costs during July and beyond..."
Couldn't happen to a better group. . .except for maybe Call to Action or Womanpriest. Are there any better symbols of sin and its consequences than the prison and the cemetery? Disobedience and death. “The founders of a new colony, whatever the Utopia of human virtue and happiness they might originally project, have invariably recognized it among their earliest necessities to allot a portion of the virgin soil as a cemetery, and another portion as the site of a prison.” In these first few lines from his novel, The Scarlet Letter, Nathaniel Hawthorne brings his readers to witness a dreary gathering, a scene heavy with sin, punishment, and individual failure. Before the prison-door stand “a throng of bearded men, in sad-colored garments and gray, steeple-crowned hats. . .” This crowd of utopian worthies has “assembled in front of a wooden edifice, the door of which was heavily timbered with oak, and studded with iron spikes.” With the grim certainty of those who believe themselves innocent of sin, the earliest Bostonians wait outside their “ugly edifice” for the village's latest sinner to emerge, to show herself as one chastened by “the black flower of civilized society, a prison.” Hearing Jesus speak so disparagingly of the citizens of Chorazin, Bethsaida and Capernuam, we might wonder if Hawthorne is right: despite our deepest desires for holiness, our most strenuous work to do the good, and the constant offer of redemption from the Father through His Son, we are doomed to reject the Holy Spirit's ministry among us and fill our prisons to breaking only to end by stocking our cemeteries for eternity. Is our story, as Hawthorne describes the life of Hester Prynne, “a tale of human frailty and sorrow”? It would grossly irresponsible of us to see only the good in our hearts, ignoring the siren call of sin so that we might pretend innocence like those waiting outside Hester's prison-cell. We would be equally irresponsible if we were to make our lives into a daily, weekly vigil against every impulse, every natural instinct that comes with being that sort of creature who knows the difference between good and evil. We give energetic life to the same pride that brought down our first parents when we dwell obsessively on our failures in a futile quest for a purity that lies beyond our unaided reach. We can be pure. But not by ourselves. Though our prisons and cemeteries mark the consequences of human sin, Christ is the rose-bush flowering outside our cell-door, along side our tombstones. He is for us “some sweet moral blossom...that relieve[s] the darkening close of [our] tale...” But he is more than that: with us he is our holiest spirit; for us he is the only light in the darkness of our sin. Jesus rails against the obstinate hearts of Chorazin, Bethsaida, and Capernaum, condemning their blindness to his mighty deeds and offer of salvation. We know that he is rejected as a heretic and demon by the temple, as a rebel by the empire, and possibly as a madman by most of those who hear him. The audacity of his message is too much to hear: the Father and I are one; He has sent me to you as your lamb of sacrifice; believe in me and you will be saved from sin and death. Too easy, too neat, too much for a disobedient heart grown muscular on the hard labor of chasing after salvation. There must be more to it than simple trust in God and love of neighbor! How like the Psalmist we can be when we find ourselves doubting God's mercy: “I am sunk in the abysmal swamp where there is no foothold; I have reached the watery depths; the flood overwhelms me.” We may have escaped the prison, but the cemetery is not far away. Or is it? “But I pray to you, O Lord, for the time of your favor, O God! In your great kindness answer me with your constant help.” And how does the Lord answer us in our mire? “Turn to me in your need, and you will live.” Even as we indulge the folly of believing ourselves innocent, even as we grow more and more foolish in our refusal to turn our hearts to the mighty deeds of God, He says to us, “See, you lowly ones, and be glad; you who seek God, may your hearts revive! For the Lord hears the poor, and his own who are in bonds he spurns not.” This promise is Christ among us. No prison door remains locked. No tombstone stands against our eternal lives. Peace is not the absence of acrimony and violence. To cease conflict, sheath our swords, and smile at one another is preferable to wholesale war, of course, but the mere lack of strife and bloodshed is not the peace that Jesus instructed his apostles to preach. The peace of Christ is found only when we discover, receive, and live out our divinely created purpose. If the Christ born of the Virgin is one person with two natures—one human, one divine—and we are the adopted children of the Father brought into His family through Christ, then we too are creatures gifted with a human nature and drawn to completion in Christ, seduced by heaven's love to love eternally in heaven. This peace—our reconciliation to God by partaking in His divine nature—cannot be achieved by selling the truth of the gospel to the philosophy or political system most likely to quell the primitive brutality of war. To our surprise, Jesus says to his disciples, “Do not think that I have come to bring peace upon the earth. I have come to bring not peace but the sword.” What does Christ's sword cut in two? And which of these two severed parts are we to receive so that peace may be ours? Jesus ends his class on how to be a faithful apostle with the startling announcement that his purpose on this earth is not to bring about global political harmony. He did not come to end war in our time. Instead, he claims, his purpose is to bring the sword that will cleanly and decisively sever the bonds of all human relationships so that our created purpose might be discovered, received, and lived out—whatever it may cost the family, the nations, or the whole human race. No fewer than eight times in Matthew's gospel reading this morning, Jesus teaches his apostles that he must be received as the one sent to bring us all back to the Father. But in order for us to receive him as our Redeemer, we must discover him as the Way, the Truth, and the Life, the final and unique source of all our ties here on earth. Jesus sends out his students and friends so that the world might hear and believe all that he has taught and bear witness to all that he has done: “Whoever receives you receives me, and whoever receives me receives the one who sent me.” By receiving Christ as the one sent to take us back to God, we abandon mother, father, brother, sister, friends; we take up his cross as our own, and everyone and everything we love now becomes a hateful distraction, a rabbit hole that can only lead us to a wonderland of temporary peace. Surely, you may object, Jesus is not telling us to abandon our families and friends in order to follow him! That is exactly what he is telling us. If we receive him as the Christ promised by God's prophets, then we must eagerly bear our throats to the sword he wields, expose all our loves to the cutting edge of his new creation. All the bonds of creaturely love are sliced clean, and we are free to refashion those loves in the one love who made us. Jesus says, “Whoever finds his life will lose it, and whoever loses his life for my sake will find it.” If the life we find is a life of love without Love Himself, then our loving lives are lost before they are lived. Only by surrendering our lives and receiving his love as our Life can we be found in Christ. Having discovered Christ, having received Christ, we are truly liberated to live as Christ. And this is the peace he died to give us. We are deceiving ourselves when we believe that peace is simply the absence of acrimony and violence. Christ's peace is not merely the toleration of and respect for the cultural and political differences we find in the world. It is not enough for us to give a charitable nod to settled conflicts and the cessation of war. The reconciliation we long for, the harmony we were created for is found only when we receive the one whom the Father sent. And as Jesus makes surprisingly clear, to receive him as our Redeemer is to lose our lives on the point of his sword. And in dying we are born again so that we may die in Christ for one another. Where's our will; where's our way? Brothers and sisters, like the Ephesians before us who heard the message of Paul, we gather this morning as we do every week to bless God the Father for raising His only Son, our Lord, Jesus Christ from the tomb. We bless Him for His gift of eternal life in Christ, for bringing us back into His holy family through Christ, and for bestowing upon us every spiritual blessing with His Holy Spirit. Our Father chose us in Christ before the foundation of the world, making us holy, without blemish before him. Loving His people, He destined us for adoption as His sons and daughters, to be taken into His kingdom as heirs by sending His Son among us in the flesh; both human and divine, Jesus lived as one of us, died as one of us, and returned to his Father's right hand as the one, perfect sacrifice that opened the gates of heavens for us and holds them open still. So that we might forever praise the glory of the Throne in heaven, God favors us through His Holy Spirit with every award, benefit, and honor we need to grow and flower as saints of the Church. In the body and blood of Christ, we are reclaimed, repaired, and reconstituted; made wholly new, delivered to divine freedom, and purified of every disabling transgression. His abundant gifts do not burden us. They liberate us from every evil and show us the Way in darkness. With wisdom and insight, Christ has revealed to us the mystery of his Father's will for the fullness of time: He brings all things in heaven and on earth to their completion, to their perfection in Christ. In him we are chosen, we are destined with the divine purpose, so that we who first and always hope in Christ will exist to praise his glory alone. In the words and deeds of Christ Jesus we see and hear the word of truth, the good news of our salvation; and believing in him, we are branded by the cleansing fire of His Holy Spirit. The fulfillment of this promise on Pentecost is the first payment of our inheritance, the first step toward our redemption as God's possession. Paul is supremely confident in the faith and fervor of the Ephesians. Are we as confident of our own dedication? Who do we think we are to take up the cross and follow Christ? Paul writes to the Church in Ephesus from prison. As a prisoner of the Roman Empire, Paul preaches a gospel of freedom in Christ from the chains of sin and death. Even as he languishes in jail, Paul shouts out God's Word across the known world. Amos, a sheep-herder and dresser of sycamores, is sent by God to prophesy to Israel. Angrily confronted by the priest, Amaziah, and ordered to leave the temple, Amos says, “I was sent by God to speak His word.” And Jesus, calling the Twelve together, sends his friends into the world, giving them authority to command unclean spirits, to preach and to teach. A prisoner, a sheep-herder, a tax-collector, a handful of fishermen, a doctor, and a few ambitious corporate climbers—all chosen, all taught, all sent to do one thing: speak the Living Word of God in spirit and in truth so that the heirs of the Father might know that their inheritance is at hand. Not one of these apostles or prophets goes willingly. Not one goes without apprehension. Not one of them leaves to do God's will without believing that he is unprepared, unworthy. But they go b/c they trust that God does His work through them and will use them to bring His will to completion. As baptized men and women, we have already accepted the call from God to be His apostles, to be those who go out and preach His gospel in word and deed. As the Body of Christ together in this chapel, we are here to say “Amen, so be it” to God's charge that we become Christs where we are. And though we may believe ourselves unprepared and unworthy, we are nonetheless vowed to do exactly that. In his letter to the Ephesians, Paul takes the time to describe to his brothers and sisters the origin and flowering of their work as heirs to the kingdom. His detailed account of their creation in love and their recreation in Christ's sacrifice is not just pretty theological rhetoric. His goal is to open their eyes and ears to the truth of their identity as ones who have been picked out, selected to do the job God has for them to do. Do you feel unprepared? Who doesn't? Nonetheless, you are a daughter of the Father, an heir. Are you unworthy? Who isn't? Nonetheless, you are a son of the Father, an heir. Are you a prisoner? A shepherd? A fisherman? Probably not. Are we without tools? Training? Experience? Maybe. Nonetheless, we are sent. The only important question now is: will you, will we go? If not, why not? What, who holds us back? Amos is threatened by a priest who invokes both divine and worldly power, temple and king. Paul is threatened by imperial Rome who invokes its divine power in the exercise of worldly power, the Emperor is God. The apostles are threatened by temple, empire, and the rulers of this world—priests, soldiers, and demons. Though threatened from every direction by every force available, Amos, Paul, and the apostles go out anyway and do what their Father has commanded them to do. Who, what threatens you? The police department? Local, state, federal government? Your pastor? Spouse? Family? If so, listen again to Paul, the prisoner of Rome: “In [Christ] we were...chosen, destined...so that we might exist for the praise of his glory...In [Christ] you also, who have heard the word of truth, the gospel of your salvation, and have believed in him, [you also]] were sealed with the promised holy Spirit, which is the first installment of our inheritance...” What creature can un-choose you? What relationship do you enjoy that trumps your inheritance as a son or daughter of the Father? What deficiency in training, moral purity, motivation, or wit can defeat the promise of your baptism? “In accord with the riches of his grace that he lavished upon us,” we are free from every deficiency that limits us, holds us back, or fights to defeat us. Are we as confident of our own dedication to Christ as Paul is of the dedication of the Ephesians? Who do we think we are to take up the cross and follow Jesus to heaven? We are, right now, everything we need to be to not only shout out our dedication for the world to hear but to continue our walk on the Way as well. We cannot be afraid or timid or lax. There's work to be done, God's work. And when we do this work with the Holy Spirit, we are more than capable; we are blessed. What we need is the will to do what we have promised to do.